Ambassadors from EU member countries in Bangladesh and Human Rights Watch on Tuesday condemned the violence against students protesting over the lack of road safety in the country’s capital. The protests began on July 29 after two young men were killed and several others wounded after being hit by a speeding bus. The demonstrations brought Dhaka to a standstill. “EU Heads of Mission stress that the violent scenes in Dhaka in recent days, particularly where schoolchildren and young people have been caught in protests or violent clashes with other groups, are a source of real concern,” an EU delegation to Bangladesh said in a statement signed by eight EU ambassadors. The ambassadors included those from Spain, Italy, Germany and France, Efe news reported. “Incidents of unlawful or disproportionate violence or action against protesters, journalists or others need to stop. Earlier incidents must be investigated and perpetrators held to account,” the statement said. The EU said it expected “all sides to remain calm and to respect the right to peaceful protest”. Sunday saw the worst incidents of violence during the nine days of the protest as security forces used riot control measures to disperse the crowds. Violent counter demonstrators were also involved in clashes with protesters and around 20 photojournalists. The EU heads of mission praised the students for highlighting the issue of road safety in Bangladesh and welcomed the government’s decision to address the issue. According to the Bangladesh National Committee for the Protection of Ships, Highways and Railroads, in 2017, 4,289 people died in 3,472 traffic accidents in the country. 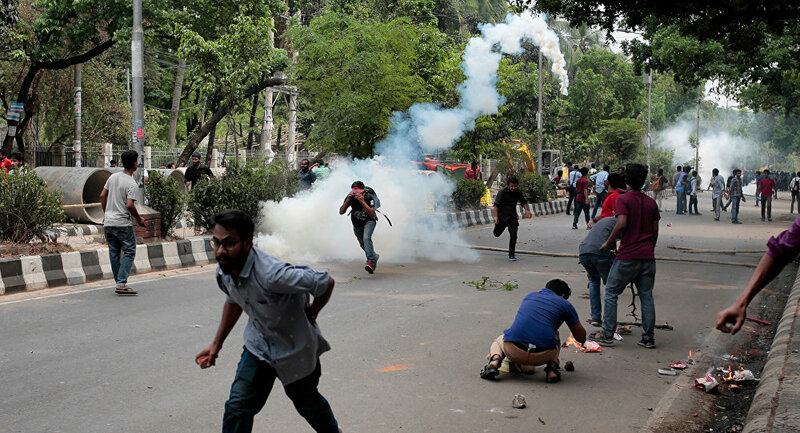 HRW also issued a statement on Tuesday condemning the violent repression of the protests, allegedly carried out by the youth wing of the ruling Awami League as well as drawing attention to the arrests of students, activists and journalists like photographer Shahidul Alam. He is accused of conducting a smear campaign against the Bangladeshi government and spreading rumours about student protests.